Would-be assassins and the fashion avant-garde should take heed. Seen below are a pair of new earrings currently for sale at a prominent online retailer. 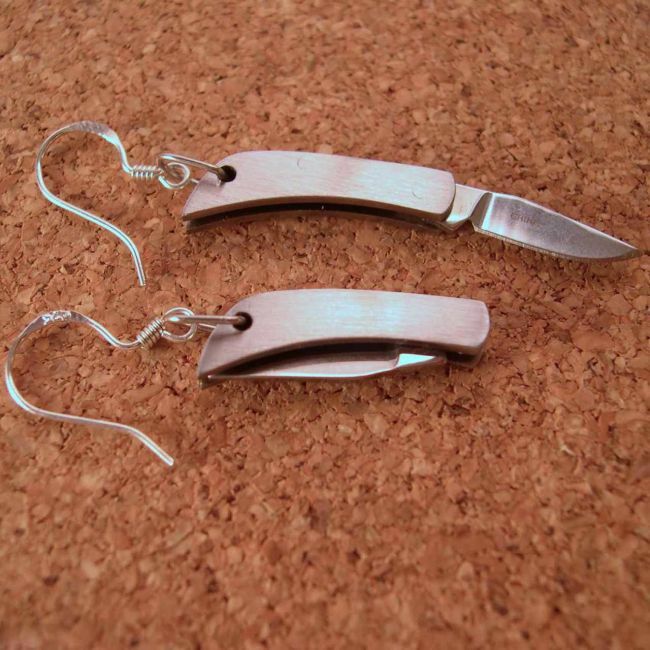 The Knife Earrings are small pocket knives that barely measure an inch. Take note, these are real knives, meaning you can peel grapes with them. At hardly an inch long with an even shorter blade, these lovelies can hardly cut your lunch time sandwich in half. Anyway, they’re sharp and sleek with a silver metal finish. Affordable too. Of course, since knives and other pointy things are also dangerous tools potential customers have to be over 18 before a purchase. It’s a requirement and at the product page there’s a checkbox for this particular condition. Age limits aside, the earrings do have lots of uses. Think letter opener, carving heart shapes on trees, and a handy utensil for eating pea salad. Yes, pea salad. Peas are good. It might save your life too, especially when you’re trapped in a crevasse with a giant boulder pinning one of your arms. No, don’t use these earrings to cut of the trapped limb. Build a fire by striking them together. To further entice enthusiastic purchases, buyers are treated to a free sharpening tool for the knives with no additional fee on top of the original $39.99. The tool itself will soon be sold separately as a necklace. A final reminder: lock these knives in place before hanging them on your ears. You don’t want knives stuck on your neck. Also, try not to bring them when you’re flying anywhere.